This truckload is pretty typical. We've all seen this in the average store; the cantaloupes and sweet corn, cherries and broccoli, watermelons. Watching these piles of food arrive I'm curious if this happens at every supermarket around the country. Each load I get from just 8 stores is between 3 and 5 tons of food. I'm going to figure that there's something like one grocery store for every 2,000 people in the USA. There are about 300 million people in the USA now. That means there are 150,000 grocery stores, give or take. If every one of those stores are throwing away 1 ton of food a week that's 150,000 TONS of food each week. Some of this food has traveled hundreds or thousands of miles. The oranges can't be grown in Washington State. the papayas -- Mexico, Caribbean, Philippines. Pineapples? Hawaii maybe. The corn has a good chance of being local, some of the vegetables -- tomatoes are probably from a few hundred miles away at the most. I feel like I'm doing my part by keeping this out of the landfill, and I'm glad that the grocery stores are doing their part. I think that this is a good use of the produce. I am just a little overwhelmed that there is this much human food wasted in our food distribution system. Would you rather buy cheese at $28 a pound if the cows are grass fed only, or cheese at $15/lb if they were fed both grass and grain. I'll note that if Tim does feed hay and grain that his operation will be, in my opinion, identical to this one that I wrote about in an earlier article, at least as far as the diet of the animals are concerned. Well, maybe not. I saw no evidence of grains being fed -- just grass. This is the slippery slope that's led us to where we are with modern agriculture. You see, you don't really have to ask this question of the average American consumer. We've already, as a society, made our choice. We have chosen the largest quantity of the cheapest food possible. So while he's posing this question as if he's doing a favor for his customers, what he's really doing is what quite a few farmers have to wrestle with: I'd like to make more money, and to do that I can either raise my prices or increase my output. There's a number of things he could do to increase milk output other than feeding grain, but he's exploring that one right now. I am in no way making a judgement about what he feeds his animals, or the reasons he does so. In an earlier discussion on his blog (in the comments section), I explained why I seek out surplus food for my pigs and other livestock. I do it to keep my produced pork available to the average consumer. I have no interest in producing a product that only wealthy people can enjoy. Everyone should have access to good quality food without having to spend every last cent. I ran across this same basic math myself, and made a choice. Now I'm curious what choice Tim will make. I've written about the new corral project before (part 1, part 2). All of the posts are in, and the railings are mostly up. The picture above shows the scale area of the corral, from the inside of the corral. Just before and just after the scale area are blocking gates, to control individual animals and allow them one-by-one into the scare area. one post is a 4x4, the other is a 6x6. The gate slides up a rail between them. This is the view of the blocking gate from inside the chute. You can see the rail it slides on extending to the top left of the picture. It's operated from outside the corral, which in the above picture is on the right. There will be a catwalk along that side, with a string to operate each gate. The rail is mounted at an angle, so that the weight of the gate closes it and keeps it closed. Per Temple Grandins' guidelines, the length of the chute is more than 3x the body length of the longest animal, and it's constructed with a curve so that the end of the chute (and the waiting truck) can't be seen until the very end. the sides of the chute will be faced with plywood to prevent the animals from balking at activity outside the gate; trucks, people, distracting dogs, whatever, also per Temples guidelines. this is the animals view down the chute -- they can see about 25' down, and then it curves off to the left of the picture. about 10' before the loading ramp there's a gate that swings into the chute, and directs the animals into one of the holding areas. So if I have an animal that somehow gets into the truckload, by using the blocking gates and this sorting gate I can quickly remove them from the load. It's been interesting working with curves in this structure. During the hot weather the last few days the piglets spent some time out sunbathing. This little guy was sleeping soundly on a pile of wood chips. Some of these guys decided it was too hot, so they're in the shade, but some like it hot. or maybe they've been sleeping so long that the sun moved. I've done that. They're pretty democratic about who they nap with. Any other piglet, regardless of size will do. I love the color variations in the herd. Here their hampshire heritage shows through pretty strongly. I think that this color scheme is pretty fun. These guys are meaty little bullets. this pair is a royal terror to the goat. The black-and-white version is pretty striking, too. Kind of reverse tuxedos. I teach classes in butchery to folks interested in getting closer to their own food, in a visceral way, so to speak. Christian, in the picture above, is getting married, and this lamb is for his wedding reception. He's brought three friends. He selected a spring lamb and off we went. These are the tools that we used during this class. from left to right: Sharpening steel, .22 rifle, meat saw, (bottom row) boning knife, skinning knife, butcher knife (top right) paring knives, marine K-Bar knife. Christian shot the lamb to stun it, and then cut its throat to drain the blood. After that was done we used a singletree that I made (you can see it at the top of the first photo in this post) to hang the lamb for complete drain. It was then skinned, eviscerated, and the organs carefully inspected and packed for use in haggis. After that we broke the lamb into primals and then into the retail cuts, covering how to french the ribs, debone the legs, and various options for the other cuts. I do this class with minimum tools and equipment, and it's aimed at people who are raising their own animals or who are interested in the process to evaluate whether they'd like to raise their own. All four of the participants of this came away with hands-on experience and the skills they'd need to property slaughter and inspect meat for their own table. Oh yea -- Congratulations, Christian! I've been building a working corral and loading chute, and as part of that project I purchased some used gates off craigslist. They're heavy steel gates with interesting hinges. Here's a couple of them. This particular hinge was designed to mount on the corner of a square post. On the gate side there's a pipe of just the right diameter to fit inside the hinge. On that pipe there's a little piece of the larger pipe (where my finger is in the photo above) to act as a stop. Here's a version of this hinge on the gate, but for mounting on the flat face of a beam. these gates are at least 45 years old. they're made from heavy steel pipe. A 16' gate (most of them were 16') weighs about 250lbs. I liked these hinges so much that I decided to make 8 or 10 of them to replace the standard gate hinges. here I'm using a big pipe cutter to cut the tub into the right size. I'll then either weld flat plates to these small pipe segments, or angle-iron for corner mounting. takes maybe 5 minutes per hinge to cut the pipe, clamp and weld it, and then drill the mounting holes. I'm going to add grease fittings to these so that I can grease the hinges as needed. Since the old hinges lasted most of 50 years already, I think that these will outlive me. You folks who live in the south or on the east coast, or pretty much anywhere but the great white north, will think that I'm being silly and saying that repeated days over 90 are record heat, but there's only been 6 times since records were kept that it's happened around Seattle. The stream of water soon becomes a slow motion river of pigs. It looks like these pigs are going through rapids, surfing. 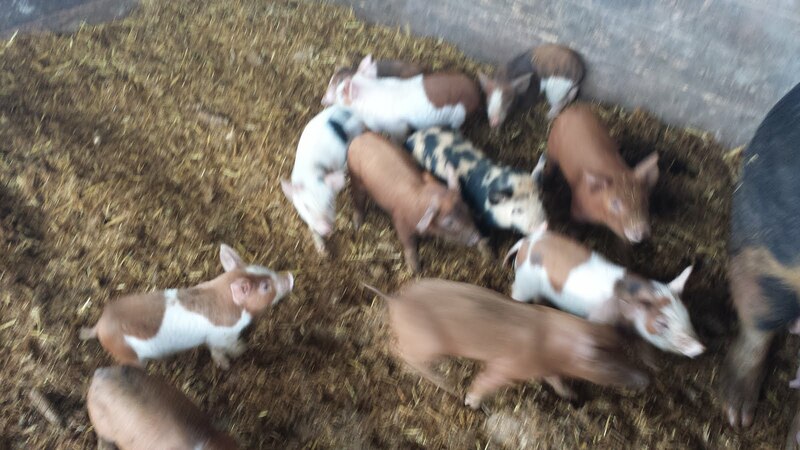 Pretty soon there's a logjam of pigs, each sow or boar carefully arranged to not quite touch the other pigs. the purpose here is to share the space, but not to share the heat. They want to be cool. When you get it just right you'll see a sow dozing contentedly in the mud, no doubt dreaming of good things to eat. I use this time to do a close examination of the pigs; walking over to them and looking at their heads and ears for any sign of parasites, their skin for wounds or lesions, and their overall condition. It's one of the few times that the entire herd will lay still for a while. Siesta. If you cannot see the videos in this post, drop me a comment with what browser you're using and what equipment (iphone, mac, pc) so i can figure out what isn't working. A few days ago I wrote that I was starting to build a corral to allow me to manage the animals in my herd more efficiently. Today I was doing sanity tests to make sure that it would work with the various types of animals that I have. There are differences in pen designs for different species of animals. Holding area 1 is 16' wide by 60' long. holding area 2 is roughly 20x30, holding area 3 is 30x25. the crowding gate feeds into a chute which has a side passage for a scale or squeeze chute. Most of the time you'll just use the straight shot into the loading dock, but other times you'll direct them into the scale/squeeze area for work or to weigh them. I want to be able to use this facility for animals I've just recently purchased at auction, for the management of my herd, and to load animals for market. The scale is so that I can show customers the animals weight, and verify what the conversion ratio is between live weight at the farm and hanging weight at the cutting facility. There's a gate (not shown) between the chute and holding area 2, so that I can run animals through the chute and either load them or put them back into holding, allowing me to sort through my herd by weight, for instance. This is the view into the chute area. the crowding gate is on the left. Where the panels are will be solid walls, and that piece of plywood will be the gate that directs animals into the scale area, behind the white board on the right. I put this up so that I could run sows and cows through the setup. I wanted to make sure that they wouldn't balk and would flow nicely through the setup before I went further. Much easier to rework at this stage than later. This is the crowding gate at full-crowd -- covering the end of the chute to the scale area. the view to the left of the white board is the scale area. I ran a pig and a cow through this a few times to make sure that they'd go in without trouble. It worked. 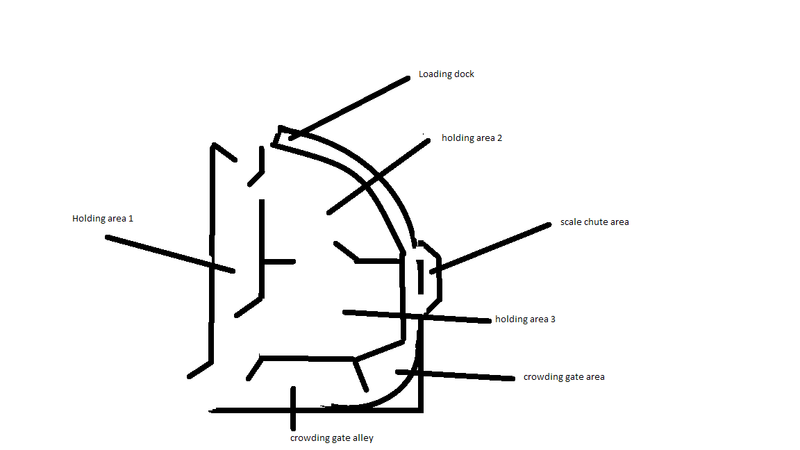 There's enough space to allow a good sightline, so that the animals going through can see the Temple Grandin recommended 3 body lengths The picture above is from the scale area back into the crowding gate area. Sanity tests complete, animals move in and out of the skeleton corral correctly. Next step is to construct the radius turn into the loading dock and then corral railings. I wrote a blog entry about how people are coming to my fenceline to look at the pigs a few days ago. Well, today this blue van driving by ran into a power pole. I can't say why this fellow ran into the pole, but he might have been looking at the pigs. I was standing in my driveway loading 4 weaner pigs that I'd sold that morning when I heard a big, booming crash and bang behind me, and then the unmistakable CRACK of a big timber going down. It snapped the telephone pole off about 2' above ground level, and the driver immediately jumped out and started running down the road. Which is kind of funny, because I know the guy. Two police cars and an aid unit showed up pretty quickly. I gave a statement to the officer and we all looked at the live power lines over my pigs. I was secretly glad he'd hit the pole. If he'd missed he would have driven through my fence and probably over a couple of pigs that sleep there, or maybe into the drainage ditch 30' farther on. He could have been killed. As it was the impact was at about 35 mph, with no braking. You can see a sow who's laid down right under the power lines. i had to shoo the pigs away several times. they were pretty curious. Since the telephone pole is over my fence I was concerned that I'd lose a big chunk of it. So I watched the whole process and kept the pigs clear. Not too long after that four power company trucks showed up and I was surprised to see them pull the stump out of the ground and reset the new pole in about 30 minutes. the pole on the right in the photo above is the new pole; the lineman is just drilling the holes for the power line insulators. the pole on the left has a big lean in it -- it got dragged off plumb by the wires and the weight of the other pole. They tried pulling on it a bit, but it's got a serious lean in it, and to fix it I think they'll have to pull it and redrill the hole. they left it for now. Something to note as you read this article: Existing farms that do confine the animals are not required to stop doing it, at least for egg producers. Only new egg producers will be barred from building similar facilities. Since the existing farms are able to use practices new ones are barred from, I suspect that this will be an effective permanent competition benefit to the farms that exist now. Not the intended result, but economics have always been a part of factory farming. Factory farms are designed to produce their product (eggs, poultry, pork, beef, milk) at the lowest possible cost of production. I suspect that most people who read this will assume that chickens will no longer be confined in Ohio 6 or 7 at a time to small cages, when the truth is that for existing farms, there will be no change, permanently. California, by contrast, barred ALL producers from using the small cages, and I find that solution to be at least competitively better, fairer. No producer has any special advantage. If you're going to say that a practice is bad and outlaw it, you should do so equally for all producers, in my opinion. I ran across a question on a public forum that asked how much it costs to raise a sheep or pig, and I wrote an answer for the costs of a pig that I raise. You can see that answer in this entry. "To buy a 3 month old lamb, providing you can find one to buy, will cost you about £30, if you buy a new born lamb it might cost you £10-£15, but you will need to feed it lamb milk at a cost of £40 a bag. Then it will need grass and hard feed which costs about £7 a bag, you'll probably need 2 bags. Also think of cost of dosing to ensure lamb is worm/parasite free, plus lambs do much better with another lamb so you'd be better getting 2. A weaner pig costs about £70 not sure on feed costs but it'll be similar to that of lamb feed, but you'll need a lot more of it! Once you have fattened your animals then you have transport costs to your local abattoir and killing out costs are about £25-£30 for a lamb, I'd triple that for a pig. Also if you haven't already got a holding number from DEFRA you'll need one, along with a flock number, tags, herd number for pig, or slap mark, plus the usual movement papers and animal record book. You might be as well buying a whole lamb and half a pig from the butchers." What I found really interesting was the references to the holding number and DEFRA, movement papers and animal record book. I've complained about zoning and land use policy in the USA, and that's caused me my share of grief, but we don't have the level of record keeping or permitting that this fellow is referring to. "4: RPA SFP. Apart from the obvious, could livestock keeping be decriminalised (stringent eartag rules putting off potential landlords fearful of losing SFP) to make life more bearable." Wow. Keeping livestock is a criminal offense. They regulate cattle trailers that are longer than 12 feet. There are multiple record inspections, and the records have duplicate information. One fellow talks about groups of inspectors visiting. "As a broiler chicken producer, I asked the environment agency how many chicken farms of the size targeted had been involved in pollution cases. The answer was none as far as they new, and they admitted that they had never been on a a chicken farm in the past as they have had no need to. Now that the directive has come in, I asked my inspector why they come every 6 months, to which the reply was that seeing as we’re paying so much, they have got to be seen to be giving good value! I suggested I paid him extra not to come at all." I'm happy to be in the USA. You can see the original question and answer here. The return of livestock to our lives. I moved my pigs into a paddock that is right next to the county road, and had an unexpected result. People drive to the farm and visit the pigs. Not just some folks, but 30 to 50 a day. I see them all day, out at the fence. All ages, all combinations. This couple were near the feeder and right after I took this photo reached through the fence and touched the back of one of the sows. Not a mean gesture -- most Americans have never seen a pig up close. You can see the backs of 3 sows just in front of them. Right now only 2% of the population are farmers, and that number is going down every day. 100 years ago it wasn't surprising that you lived with animals -- you had a horse that was your primary transportation. if you wanted eggs, you kept chickens. It wouldn't be unusual to find a dairy cow out back, if you liked milk, or a few pigs to provide your winter pork. I'm not talking about pets, which are the modern thing, I'm saying that your life was much more involved with animals than most folks today imagine. I like seeing these folks out there. I think that it's the way it used to be for thousands of years, and I think that we, as a race and a culture, miss it. I offered Walter Jeffries $10,000 to raise 4 pigs following his own guidelines. He declined. You can see the offer and the comments here. Walter Jefferies over at Sugar Mountain farm has talked a lot on the net about pastured pigs, and the majority of his writing is good stuff. He's an interesting fellow with strong views on a number of topics. He's even on TV doing interviews. In this interview, he claims to have been raising pigs for 12 generations. In his blog, in this entry, he claims to have started raising pigs in 2002 or 2003. 2010-2003 = 7 years. UPDATE 8-15-2010: Concensus opinion is that it takes 1 year per generation. Sorry Walter. See the comments, below. Unless Walter is doing something magical, you're going to get at best 7 generations out of 7 years. So I asked him about it. You'll find the discussion in the order it happened on homestead hogs in the comments below. You can find the original here. Why am I posting this here? Walter and I were asked to take the discussion off board, and Walter has complained that the other place he posted stuff to, homesteadingtoday.com, has a bias against him. Well Walter - and everyone else -- I won't delete anything you say. I'll post it all. Enjoy. I've got black pigs; does the color come off easily? How do you scrape a pig and get a good result? This is a black pig that is in the process of being scraped. As you can see the black pigment is literally skin deep, and scrapes right off when the pig is scalded. The white areas are where Luke and his friend Scott have completed the scrape. To get a good scrape, bring 20-30 gallons of water to a full boil, and use a ladle or small bucket (as show in this picture) to pour the boiling water on the pig. Use your fingers to test to see that the skin comes off easily, and use a dull instrument to do the actual scraping. Here Luke and Scott use cake spatulas, which I've found to work pretty well. You can see one in Scotts' left hand in the photo above. I buy them at kitchen supply houses for $5. You can see the metal garbage can and propane torch setup that I use to heat the water in the left of the picture above. it takes about an hour to bring 30 gallons to a boil. The platform that holds the pig should be right about waist high. you don't want to have to stoop down to scrape the pig. Freight pallets make a GREAT scraping platform on top of a couple of cheap sawhorses. Don't use water that is less than boiling, and start the scraping process very soon after the pig is killed. Pour water on a small area, get that area completely done before you move on to the next area. Don't dunk the pig -- areas that have heated and cooled will "set" the hair, and it'll be much more difficult to remove. You will also partially cook the skin, which makes it much softer and you'll end up splitting the skin if you do this. Finish the scrape by either shaving or singeing the few hairs that remain. This pig was scraped in about 45 minutes by these two fellows, and this was the first pig that they've ever scraped. ...try to convince as many people as you can to help you scrape. It's a group activity. I built a corral at my cow pasture last year (part 1, part 2, part 3, part 4, part 5) to allow me to load/unload the cows and work with them as needed. Cows that are grazed are not tame, and having a secure, fenced area and good loading facility means that I can use the property more efficiently, and more important, reduces the chance of injury to me or to the cows. A properly built corral means that one man can safely load a trailer of cows in a pretty short amount of time. This corral is being built to allow me to work on every type of animal i keep in quantities; pigs, sheep and cows. So the measurements are a little different -- pigs are just as wide as cows, but much shorter, sheep are much smaller than pigs or cows -- but the basic functions will all be there. I'm going to incorporate a livestock scale and squeeze chute into this design. What I'm after is to be able to better manage my herd and track growth and weight more easily. With a proper setup, weighing the herd gets a lot easier -- one way to do it is to train the animals to get to food. After a few repetitions, they'll line up for the trip. The basic timbers I'm going to use are 6x8" 16' long posts for the gate posts, and 6x6x10' posts for the fence posts. for the rails I'm going to use 2x6 lumber, and I'll coat all of the boards that aren't pressure treated with preservative before they're mounted. The reason that I'm going larger on the timbers is that the last corral I built with 4x4s, and it just isn't sturdy enough. the bigger posts do raise the material costs about 20%, but sturdy is what I'm after, particularly if I'm having to deal with agitated animals that weigh 800 to 1400lbs, as I might if my farm floods. The big difference between this time, as far as the actual construction goes, is that I planted the post with the crowding gate, which is used to move animals into the loading/handling chute. 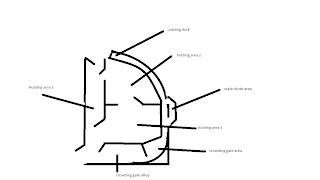 By placing this post first you can use the gate swing to plant all of the other posts in the radius turn. Here, the post is in a hole and is being positioned and leveled before it's concreted in. what I'm after is a fit for the gate that looks like this. Inside this post there will be 2x6 rails covered with 3/4" plywood for a visual barrier. The long spikes that form the gate latch will go through all of that, providing a positive latch. each of the posts, at 8' intervals around the round edge of this crowding tub, will provide a "ratchet" -- you herd the animals in, and then use the gate to follow in behind them. As you move foward with the gate you can latch it at any point to prevent the animals being chuted from pushing it open. each of these posts will either be a latch for a gate, or the post that the gate is mounted to. the overhead boards prevent the top of the post from moving in any direction. The posts are 6x8s, the overhead boards are 3x8s which I cut in my sawmill. To allow easier tractor access, the majority of these gates used for this corral are 16'. I purchased all of the gates used, off craigslist. They're really nice, heavy steel gates, but need a well secured post to make them swing correctly. Each post has 6 80lb bags of concrete anchoring it. Found one of my young ewe lambs today. the area I found it in was a pig wallow last year, and is pretty soft. Either the sheep was chased into the mud and got stuck, or it got stuck and then something started eating it. When I found this sheep it was still alive; the spinal cord had been chewed through halfway down the back, and the right lung was punctured. you could hear the breath going in and out of the sheep. I looked carefully at the wound and then went and got the rifle. I looked at the mud carefully, hoping to figure out what had done this. There were no distinct prints. There also wasn't enough of the sheep eaten to call it a coyote attack,and no sign that the sheep had been dragged -- no marks on the neck or head, which is usually how a coyote drags it. After looking at it for a half hour, I believe that this sheep got stuck in the soft mud, and some sort of bird started eating it. Maybe a vulture or an eagle, or a red tail hawk, all of which are in this area. It just doesn't look like a canine predation scene. On the husbandry side, I'm going to have to fill this hog wallow in. It's clearly a deadly sheep trap. what on earth am i feeding my pigs? One of the questions I get pretty regularly is what I feed the pigs. Here's today's menu: Surplus/expired/wilted produce. As you can see, it's a mix of all sorts of vegetables and fruits. Pineapples, watermelons, corn, oranges, papayas, apples, and basically every other type of fruit or vegetable you'll find at a supermarket. The pigs pick through the produce and eat what they want, the rest gets mixed with wood chips and then composted. I particularly like this sort of feed because otherwise this stuff would hit the landfill and be lost. I get 30 to 60 yards a week (a dump truck is 10 yards) of this, and it really helps to keep the feed bill lower.